After our nap yesterday, we realized that the Newcastle Knights were playing the Canberra Raiders in rugby league that evening, and we felt pretty good and recovered enough from the passage to go out.Â Andy bought tickets online, and we set off. 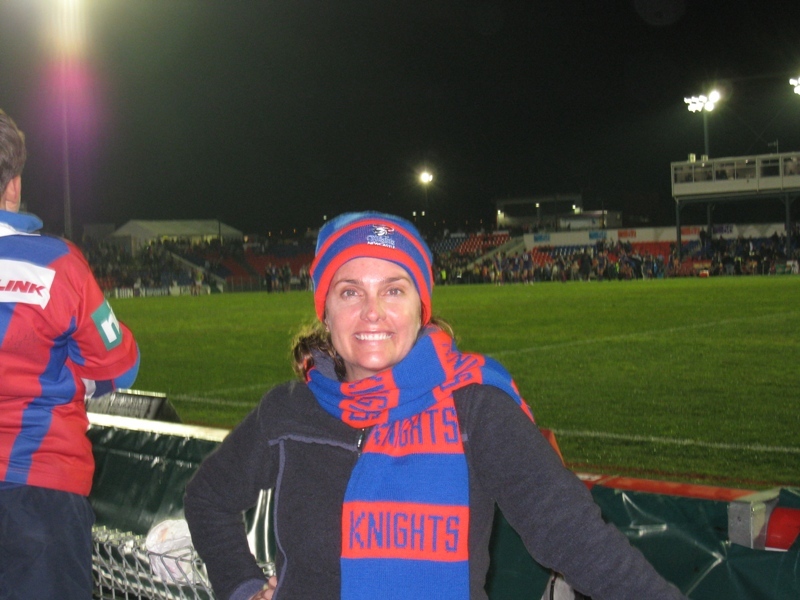 Newcastle Knights Super Fan -- and much warmer rugby league spectator! We then went next door to have a bite at the local restaurant which happens to be one of the best in Newcastle, and it was really good.Â We hopped into a taxi and headed out to the ground.Â I immediately realized that I was going to be too cold, so we swung by the team shop and I instantly became a Newcastle Knights super fan by double bill-boarding with hat and scarf.Â After a convincing Knights victory, we cabbed it home, had dessert and decaf at the local, and went to bed.Â Tomorrow we’ll rent a car and head out to the Hunter Valley wine country. Yesterday, we had big plans to leave Newcastle at first light since Coffs Harbor was about 175 miles away and the East Australian Current is always a concern.Â Unfortunately, we slept in so soundly, and then suffered some separation anxiety with the marina’s cheap, fast, and reliable wifi.Â But we managed to shove off around 10:30 with a flexible plan of making landfall at Port Stephens (about 5 hours away), Coffs Harbour (about 30 hours away), or Gold Coast (about 55 hours away). The trick to communicating on a boat is the delicate balance between notification with a sense of urgency and scaring someone to death with a tone of emergency or impending disaster.Â I leaned into the companion way, and as calmly as I could, I said “military plane” in a flat but loud voice.Â Andy shot up immediately to catch the show.Â It made a wide loop out over the ocean at fairly low altitude … deafeningly loud and very exciting. About 10 minutes later, we had a humpback whale sighting!Â Again, I leaned into the companion way, and as calmly as I could, I said “whale” in a flat but loud voice.Â Again, you have to be careful not to communicate a message of panic or emergency, but rather just a really cool sightseeing opportunity.Â Anyway, it was a pod of at least three whales traveling up the coast together.Â We mostly saw their spouts and backs … no flukes or fins or full breeches this time, but very cool nonetheless. This storm, and the weather warning of high winds, chased us all the way into Coffs Harbour. And we just barely made it!Â Literally, we had minutes to spare as a huge, angry-looking storm chased us in to shelter.Â The slip was barely big enough to hold us and the neighboring boat already moored there, but, in his best performance yet, Andy perfectly threaded the needle.Â Oh, bowthruster, how do we love thee?Â Let me count the ways! We grabbed the shower bag, stopped at the marina office, and per their instructions, opened the lockbox to obtain the keys.Â We had dinner at the closest restaurant, and it was actually pretty good.Â I had yellow fin tuna that was probably just a few hours fresh, although, I felt Andy’s brother, Erik, also known as the Seahadist (the seafood Jihadist), breathing down my neck for not eating something else (Artic Char? ).Â His overwhelming knowledge about, and activism to stop, overfishing are really cutting into my enjoyment of seafood! 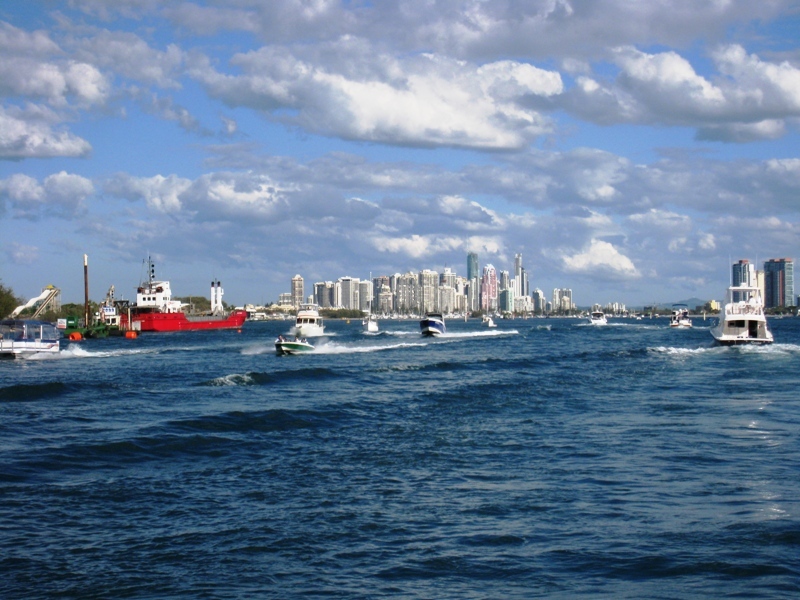 Arrival in Gold Coast — Welcome to Queensland! Well, during the passage from Coffs Harbour to Gold Coast, we passed two milestones.Â First, we said goodbye to New South Wales, and hello to Queensland.Â Second, we left the latitude of 30 and higher behind us.Â I am relieved to have re-entered the milder waters and warmer temperatures of the 20s … equator, here we come! Anyway, I was totally engrossed when a humpback whale surfaced and blew its spout less than 50 yards away from the boat.Â It was startling, but so incredible.Â We’ve seen a lot of whales now, and it never gets old.Â It’s just amazing to experience such a rare and exotic animal in such natural way … no tour group, no whale-watching guides, no throwing food in the water … just observing a whale doing what whales do, and have instinctually done, forÂ millions of years.Â Being that close is like meeting a dinosaur or something.Â It’s awesome, in the truest definition of the word. 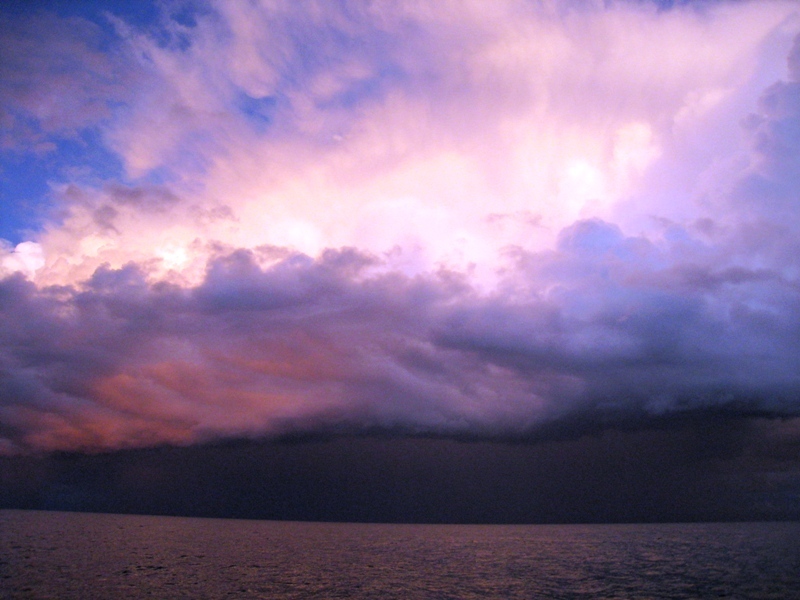 The approach to Gold Coast was pretty chaotic. We located the channel entrance mostly by following the 30 or so boats heading in after a Sunday afternoon on the water.Â The currents going over the sandbar were weird enough, but the wakes of macho, speed demon, power boats bounced us around as well.Â Dinghies, jet skis, fishing boats, whale-watching power catamarans, party barges … it was pretty much total chaos.Â But, we turned the corner and followed the very distinct aids to navigation, easily found the marina, filled up with diesel, found our slip, and settled in.